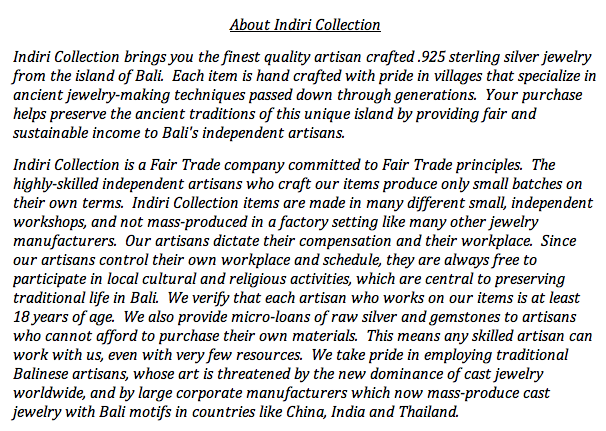 Indiri is a collection of handmade sterling silver that is made in Bali. It is fair trade jewelry and none of the items here have been mass produced, they truly are crafted by artisans in Bali, not imitations that come from facilities using casting techniques. The feel of Indiri made jewelry is soft and heavy, it is quality from every angle and is very obvious to the touch that it is fine quality work. We carry an extensive collection that features dome of the items below as well as many rings, pendants, chains, and bracelets.